1. Boil tamarind in water, extract pulp and add 3 -4 cups of water. Add prepared powder and salt. 2. Fry the crushed garlic in 1 tsp ghee, add to tamarind water along with 1 sprig curry leaves. Set to boil till it is considerably reduced in quantity. 3. Heat the other tsp of ghee, add mustard seeds. When done, add the curry leaves. Pour this seasoning into the boiling rasam. Add 1 – 1 1/2 cups more of water, chopped coriander leaves, simmer once and remove. Serve hot as an appetizer. A very good remedy for cold and indigestion. 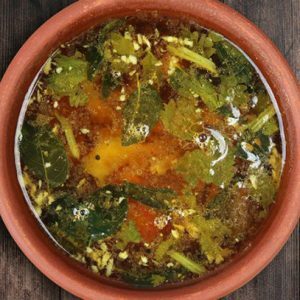 Feel free to comment or share your thoughts on this Poondu Rasam Recipe from Awesome Cuisine.